Your Android smartphone makes phone calls. This much is obvious. But did you know that your Android tablet can make calls too, with the right app installed? We’re talking, of course, about Microsoft’s messaging and VOIP app, Skype, an app that can revolutionise the way you make calls and connect with people. Widely used over the past 10 years, Skype is a very useful addition to any Android device. But the chances are you’re not familiar with it; alternatively, you might have an older relative wielding an Android smartphone for the first time (and we hope you showed them our guide written especially for such an occasion So You Got a New Android Phone: Here's All You Need To Know So You Got a New Android Phone: Here's All You Need To Know Ooh, shiny! Nothing like a brand-new, modern smartphone to start out the new year. Read More ). We’ve put this introductory guide together just for you, so that you can print it out and keep it, or hand it to your parent/neighbour/in-law/friend so that they can embrace and use Skype. It’s easy to ignore or overlook Skype as a bit of a gimmick. But it really does do what it claims: it allows you to make cheap international and local phone calls. This is done either for free by calling another Skype user, or for a low charge if you’re calling a landline, mobile, or business anywhere in the world. For the past few years, mobile versions of the Skype app have been revolutionising how we use smartphones. 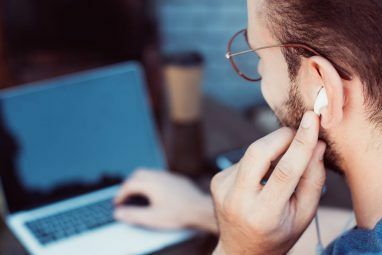 Not only can you make calls and message other users cheaply, calls can be voice or video, and they can go to other phones, tablets, or desktop computers. To start using Skype on your Android device, open the Play Store, search for Skype and tap Install. You can do this on your phone or by opening Google Play in your browser. As long as you are signed into Google Play with the same account as you use on your Android device, the app will install. Upon launching, you will be required to sign into Skype. You can use an existing Microsoft account (Windows, Outlook, Xbox Live, Hotmail, or OneDrive — they’ve all been merged into one universal account 5 Security Tips to Consider When Using a Microsoft Account 5 Security Tips to Consider When Using a Microsoft Account You can't use much of the new Windows 8 user interface without a Microsoft account. The account you for logging into into your computer is now an online account. This raises security concerns. Read More ) or click Create account to open a new one. An existing Skype account from your desktop computer can also be used. At this stage, you may be invited to add call credit to your account. This can be used on any device running Skype, not just your Android. Credit can also be added at www.skype.com. Before you add credit, however, ensure the app is working as intended by making a Skype to Skype call. Unlike the desktop version of Skype, it isn’t possible to make a test call. 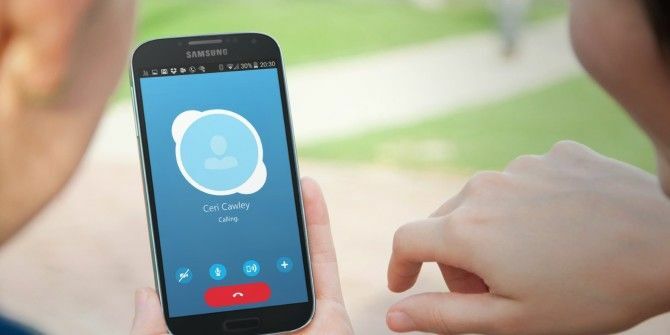 The next best thing is making a Skype-to-Skype call, which will enable you to check that the app works, that your voice is heard by the recipient of the call, and vice-versa. What if you haven’t added any Skype contacts yet? Should you have just created your account, there will be no Skype contacts (although if you have used an existing Microsoft account, any contacts you had added to that profile will who use Skype will be displayed). The best tactic might be to email or message someone you know uses Skype, add their username, and let them know you’ll be calling. A contact can be added to the app by opening the menu and selecting Add people. Enter the username of the contact and when the app find them, click Add to contacts to save them. You might alternatively tap the call button to drop them a line right away. You’ll find that the menu is slightly different when you open it in a newly added contact. Here you’ll have the opportunity to Add to favourites, a useful screen that features your most-called contacts. It’s a nice shortcut for getting in touch with people without flipping through the app. You’ll also see options to Edit contact, Block contact and Remove contact, each of which is self-explanatory. With the Skype-to-Skype call completed, it’s time to try a Skype-to-Phone call. This can be a landline or a mobile number, and requires that you have some credit in your account. Making a call is as simple as you might expect it to be. Simply open the app and tap the phone button in the bottom left corner. From here, enter the number, tap Call, and you will be using Skype as a standard phone! You can use the app switching function on Android to check numbers you found online as you enter them, as illustrated above. As well as making calls with Skype, you can use the app to send messages to contacts with Skype accounts. This can be useful for arranging a call or just having a quick text chat, and multiple recipients can be added for a group discussion. This might be useful for talking to a group of family members or work colleagues, for instance, or a group whose members share the same interest. Have you noticed the camera icon in Skype? It can be found in the lower left corner of the display when you open an existing Skype contact, and it is there to launch a video chat conversation. As long as you have a strong mobile Internet connection 3 Ways You Can Improve Smartphone Reception 3 Ways You Can Improve Smartphone Reception Whenever I’m at my favourite pub (admittedly not often) or at my mother-in-law’s (sadly more often than I would like) I find that I have considerable trouble making a phone call. 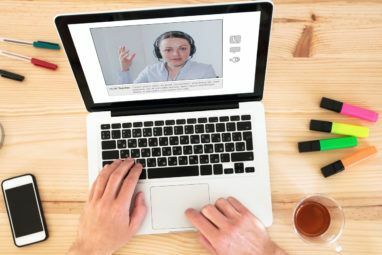 How can mobile phone... Read More or are connected to a wireless router, you’ll find that a video call can revolutionise how you use your Android device. This does, of course, rely on your phone having a built-in front-facing camera. Video calling can be a battery drain Find out Which Apps Are Killing Your Android Battery Find out Which Apps Are Killing Your Android Battery If you're getting poor battery life on your device, you likely have an app abusing your battery in the background. Find out how to identify those apps and solve your battery problems. 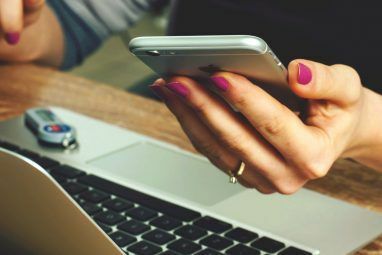 Read More , however, and if you’re using metered mobile Internet then you’ll find that it isn’t cheap, so use with discretion. A few advanced settings can be found in the Android Skype app which will ensure your privacy when using the app. Unfortunately, some Skype users make money from spamming users like you, which they do by sending instant messages. You can easily stop this behaviour from affecting you by opening the menu and choosing Settings. Scroll down to the Privacy section and ensure that Allow IMs from is set to Contacts only. Below this, you might also want to limit who you Receive calls from, with Contacts only and Anyone the choices. Most importantly, you might like to keep your age and gender private from Microsoft’s targeted ads system, so make sure you clear the checkbox against Allow Microsoft targeted ads. As you can see, Skype can be used in a number of different ways and is simple enough to be picked up by those new to the app or even new to smartphones. And it can save you money! Hopefully by now you’ve installed Skype on your Android device. For other beginner tips and tricks, don’t forget to check out our two part series on how to make your smartphone work for you New To Android? Make Your Smartphone Work For You, Not Against New To Android? Make Your Smartphone Work For You, Not Against Do you have a smartphone that you just can't seem to figure out? Learn the basics and start conquering your Android phone now! Read More , and how to master it New To Android? Part Two: Master Using Your Phone New To Android? Part Two: Master Using Your Phone Part two of the Android guide for absolute beginners. Get a grip on the basics of using your smartphone! Read More . For questions on the contents of this tutorial, please use the comments box below. Explore more about: Skype, Video Chat / Call. Why i cannot add people? Thanks for the exposure but l am still not able to make calls on Skype, why? whenever i make a video calling through Skype in android, the other side people can view me but i cant view them whereas i'm seeing myself in the video. how do i get through this???? Could be bandwidth. Try it on your home network with a mobile device using a second account and see if you can get a picture that way. If it works, then there is a problem with the data via yours or your contacts' ISP. I can video someone and they can see me but I can't see them. What am I doing wrong? I have an Android tablet and get audio but no video with Skype. Camera button is present but has no affect when tapped. Tried to join a Skype session. I can join with no problems on laptop running Windows 7. Is it only those callers who aren't notifying, or is it all Skype contacts? Not able to sync all contacts in Skype when i am installing it on my Android phone. How can I get a second Skype account going on my Android Tablet so that I can call home when away overseas? have you tried a third party app such as IM+? What Does It Mean When a Yellow Light Pops! Up?